A short biography of leading Italian anarchist militant Errico Malatesta. "Anarchism is organisation, organisation, and more organisation." Errico Malatesta, who coined the unambiguous phrase above, was born on December 14, 1853. 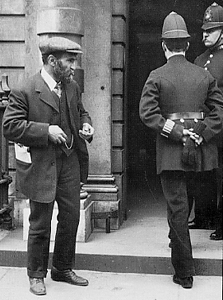 He dedicated his life to the anarchist cause, joining the Italian section of the First International Working Men's Association in 1871, shortly after the Paris Commune uprising, and dying on July 22 1932 while under arrest ordered by Mussolini. ... In a short time in Ancona, anarchists and sympathisers number some 600 individuals, consisting predominantly of dock porters, workers, and criminal elements of the town. ... his qualities as an intelligent, combative speaker who seeks to persuade with calm, and never with violent, language, are used to the full to revive the already spent forces of the party, and to win converts and sympathisers, never losing sight of his principle goal, which is to draw together the forces of the party, and undermine the bases of the State, by hindering its workings, paralyse its services, and doing anti-militarist propaganda, until the favourable occasion arises to overturn and destroy the existing State”. Malatesta was born sometime in the 40's or 50's, definitely not 1877. How could he have led an insurrection the year he was born? Or join the IWA 6 years before? Errico Malatesta (December 14, 1853 – July 22, 1932) according to wiki. I've edited the article and fixed it. Thanks for the information! Please bear in mind though that all of our users are able to edit articles, with moderate approval, so if you see a mistake like that again please feel free to click edit and fix it yourself.